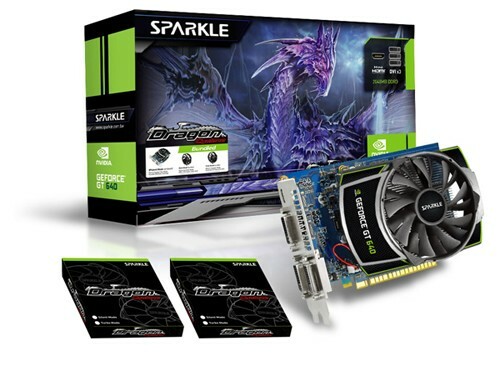 Taiwan, Taipei – 2012/08/14 – Sparkle, one of the leading manufacturers of graphics solutions launches the latest product – Sparkle GT640 OC Dragon Cyclone. 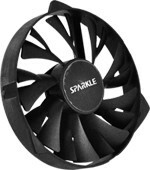 Sparkle GT640 OC Dragon Cyclone features 384 CUDA cores packed with GPU, memory set to 128 bits 2048MB DDR3. 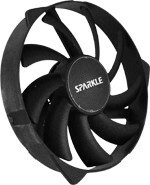 Sparkle GT640 OC Dragon Cyclone equips with Dragon Cyclone Cooling Solution; with 90mm double claw blade design, easily generates 20% more air flow and dissipates the heat from solid fan base structure fully covers key components. 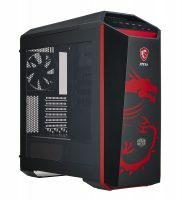 Moreover, the exclusive Dragon Cyclone cooling solution features patent pending exchangeable fan design, gamers can easily replace different cooling fan included in the box with high efficiency mode, turbo mode and silent mode, simply satisfies every gamer and creates the best user experience. Efficient Mode, 20% more air flow! 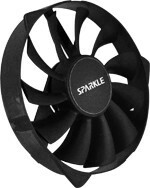 Efficient mode utilizes double claw blade design; by separating air flow from the unique blade design, it dissipates the heat from solid fan base structure fully covers key components and delivers the best gaming experience for all gamers. Turbo Mode, 40% more air pressure! Turbo Mode increases the air pressure immediately, cools down the heat from GPU and memory module– It’s design for gamers who pursuit for extremely Overclocking Performance. Silent Mode, 15% Less Noise Level! Silent Mode delivers less noise level from scimitar blade design, performs the best cooling performance without any compromise between noise level and efficient cooling. Design for Player like Extremely Silence.